Amy Barker, an office worker, was truly surprised when Mark Wright handed her a bouquet of flowers on Surprise! Surprise! hosted by Holly Willoughby on Wednesday night. Amy helped raise almost £600 for the first Macmillan World’s Biggest Coffee Morning. Amy was called, “a ray of sunshine” by those who she works with. The UK is a better place with people like Amy around. Let her be an example for all to follow. Amy Barker is a little ray of sunshine, and her cheeriness has landed her on prime time TV tonight (Wednesday, October 29). Amy, of Torcross Road, Ruislip , was set to appear on Surprise Surprise , presented by Holly Willoughby, which aired on ITV1 at 8pm, during a commercial break, in the spot when nominees are surprised by TV and radio presenter Mark Wright as he turns up with a huge bouquet courtesy of show sponsor, Interflora. getwestlondon was sworn to secrecy until after the show had gone out. Holly Willoughby, presenter of ITV’s Surprise Surprise. Amy was nominated by her boss at Social Investment Business in King’s Cross, Deborah Smart, for being a ray of sunshine in the office. Amy recently organised the first Macmillan World’s Biggest Coffee Morning to be held in their office, and despite there only being 40 members of staff, she helped raise almost £600. 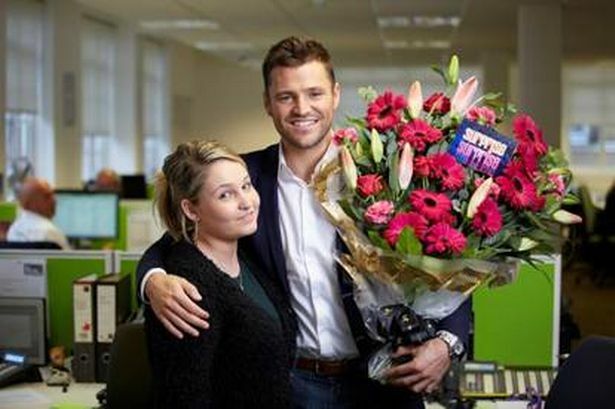 Amy Barker was handed a huge bouquet of flowers by Mark Wright for her contribution in helping raise almost 600 pounds for the first Macmillan World’s Biggest Coffee Morning. It’s good that ITV recognizes people from all walks of life who make even small contributions to society. We need more “rays of sunshine” like Amy Barker in this world!